So far, I had been attacked more in the past two weeks than I had been in my entire life. Now I had been informed that the fate of Neopia might rest in my clumsy hands. Oddly enough, I wasn't bothered by these things. They were simply facts, pieces of information no more important than physics equations. I could look at the facts, analyze them, ponder them - but I didn't feel any emotion from them. The facts just were. Once again, my view was about to change. This was about to get personal. I was tired. Absolutely, completely, achingly, exhaustively, tired. After the meeting with Fyora, I had walked outside the palace, hearing snatches of conversation as I passed. 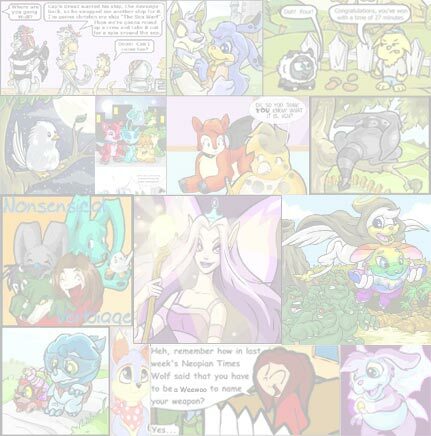 Faeries, Neopets, and Humans alike knew that I had something to do with the strange events, but they didn't know what. Some seemed to blame me, but from what I could hear most people agreed that Fyora would have fried me to a crisp if I was somehow responsible. The most worrying was Rycio, the dark Faerie I had seen earlier on my way in. She couldn't seem to stop smiling. Infernus and I had talked over all we had seen, comparing views. I told him about the meeting with Fyora, and all the news she had shared with me. Infernus took it with his usual calm, but seemed worried. Very worried. Eventually we had flown home. I was so busy pondering the events that I completely forgot to be scared, even when Infernus was hit by a downdraft of air that nearly knocked us into the ground. Now, I was back home, and very, very tired. I called Child_Dragon to make sure she was alright. She was, as was Un-Eairkagh. Thankfully, their house had been far enough from mine to avoid being attacked. I didn't tell her about the meeting with Fyora just yet... I needed time to think things through first. I walked to my room and stared at my bed. Without realizing it, I had been avoiding going to sleep for some time. Somehow, I knew that Nightmare was waiting for me. I forced my eyelids open after they dropped shut for the fifth time. It seemed there was no avoiding it. I had to sleep sometime. I forced myself to relax. Placing my scratched and dented saber on top of a dresser, I laid down and fell into sleep as if into a hole. It was dark. I looked around, dimly aware that I was in a cavern of some kind. Stalactites hung from the ceiling, so close that I had to be careful not to bang my head. The walls pressed in close, and the sense of claustrophobia was strong. A noise! Something was behind me. I turned, but could see nothing. The noise came closer - an oddly rhythmic scratching noise, like a Kougra's claws clicking against a solid floor as it walked. I peered into the darkness, noticing that I was holding my saber again. A vague shape moved - a deeper darkness against a background of lesser dark. Two points of red flared into existence, burning like coals. Eyes. Nightmare's eyes. Terror filled me. I could not fight that - thing! I turned, running through the cave, vaulting rock formations and scraping against walls in my haste to escape. Dust filled the air from my passing, caking against my pants and shirt. The noise behind me grew louder. Abruptly the cavern came to an end. A wall, a simple solid wall of stone blocked my path. I could run no more. I turned around. Nightmare stood calmly, as if he had been waiting for me all along instead of chasing me like some kind of predator. Unlike everything else in this dreamworld, he was sharp edged and distinct, lacking the vague, unreal quality of the rest of my dream. He was huge, easily larger than a full grown Skeith. His low slung body rested on 6 legs, 3 on each side. Those powerfully muscled limbs were clawed like a Kougra's, explaining the odd clicking noise I had heard as he walked. A thin tail lashed back and forth slowly, and I noticed a barbed stinger on its tip. It was the face that drew the most attention, however. It was a simple rounded shape, almost lizard-like. Two red eyes blazed at me, flickering with what appeared to be amusement. A mouth stretched in a permanent grin, fangs of varying shapes and sizes gleaming. That horrible mouth opened. "A pleasure to finally meet you in person, Sabreur," Nightmare hissed, smiling, ignoring my sword completely. "You can talk?" I stammered, trying to comprehend this latest development. Nightmare smiled again. "But of course! And I have always wanted to talk to you, my good friend." "I'm no friend of yours!" I yelled, summoning up some reserve of courage. Nightmare twitched his tail and spoke again, and my courage fled. "Oh, but you are... You are the one who will let me into Neopia. You are the one who will help me achieve my dreams. You are the one who will make my dreams real. OUR dreams real." "Th.. that's crazy. I'll never let you in - I don't even know how! Besides, haven't you heard? If you do break into Neopia, the Shadows will break through, too. Neopia would be destroyed, and you with it." Nightmare laughed and waved a clawed limb, making me shudder. "As you say, Neopia will surely perish. But as for me..." He stopped smiling, and looked directly at me. "Fear is my meat. Pain is my drink. The Shadows will cause fear and suffering to all. And I will take that fear and grow ever stronger. The Shadows do not worry me at all. We are simply two sides of the same coin. Indeed, the Shadows and I will be allies when all is said and done. And together, this world will be ours." Nightmare flicked his barbed tail. "As for letting me into your world, it is easy. All you have to do is join me, and the gate will open. The beauty of it is that even if you don't join me, I will soon be able to force my way through with or without your help. By making things easier on me, you could share in the dominion of this world. All Neopia could belong to you, me, and the Shadows." I didn't know how to respond to that. So instead, I asked the question that had been bothering me from the very beginning. "Why me? Out of all the Pets and Owners in Neopia, why did you pick me?" Nightmare growled, and turned his head. I flinched. After a moment, he looked back up at me. "It is simple, really. 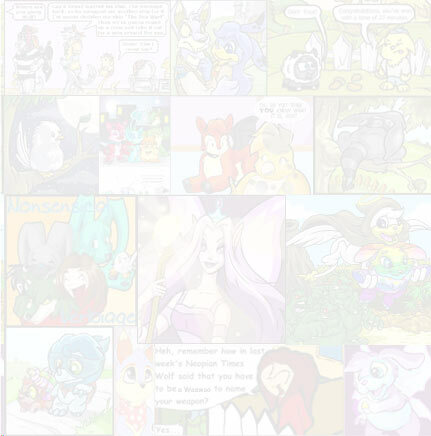 I tried to use a Neopet once, and failed miserably. The dreams of the faeries are untouchable to me, so I was unable to use one of them. As for humans... Every human dreams differently than others. It is difficult to describe, but suffice to say that I need a human who dreams the same way that I dream." He started stalking towards me, and I raised my saber to ward him away. "Out of all the humans in Neopia, you alone are the one who dreams as I do. It is your destiny to open the way for me. Now drop your blade and side with me." I backed away, franticly waving my saber back and forth. Still Nightmare advanced. Finally, I felt the cavern wall behind me and could back away no further. With speed I could scarcely imagine, Nightmare lashed out with a claw and smashed my saber to the rocky floor of the cavern. A sharp crack echoed throughout the cave. He raised his foot, revealing the broken shards of my sword, and looked up at me. "Do you really think that a little thing such as you can withstand me, you little fool? Join me and you will live. Forget those you love, forget all that you care about. This is all that is important now." I awoke with a start, my alarm clock buzzing in my ears. Rubbing my eyes, I fumbled with my hand and finally turned it off. I struggled out of bed, desperate to get breakfast in the hopes that such a normal activity could somehow remove the awful memory of the past night out of my head. A glimmer of light caught my eye. I turned, almost against my will. My saber lay on the dresser where I had left before I went to bed. It was shattered beyond repair. "So it was real," I muttered to myself, picking up the hilt and the two inches of blade still attached to it. The saber had been nothing special really... Just a Sword of Domar that I'd modified a little. But it had been almost a part of me, something that I could rely on. Like seemly everything else in my world, it was shattered. A sound interrupted my thoughts. A soft thump, muffled but still audible. My heart leapt into my throat. Unsure what to expect, I slowly moved into the hallway and crept towards the sound. Another noise, also muffled. It was coming from my lab. I crept towards the door. It was steel, solidly built to contain my various accidents. The two halves of the door interlocked in the middle, and a red button to the side was marked, "Open/Close". I cautiously placed my ear against it, letting the cold steel transmit the sounds of the room. Furtive shuffling noises reached me. Someone was sneaking around inside my lab. I briefly considered going for the police, but the risk of some criminal escaping with one of my Improved Firebombs seemed too great. I looked down at myself, armed with a broken saber and still dressed in pajamas. "Here goes nothing," I whispered and punched the "Open/Close" button. The two halves of the door slid aside with a thump and I leapt into the room. "SURPRISE!!!!" a roar of sound greeted me. Banners reading "Happy Birthday Sabreur" hung from the ceiling. Colored streamers hung from the benches and tables, and confetti filled the air. Child_Dragon, Un-Eairkagh, Infernus, and a horde of Kiddo's friends (who I can never quite keep track of) stood in front of me. I stood in my pajamas, broken sword in hand, mouth open in shock. Un-Eairkagh was dancing for joy, his wings flapping excitedly. "Did we surprise you!? Huh!? Did we!?" he yapped, barely able to contain yourself. Kiddo walked up to me, a colorfully package in hand. "Don't tell me you forgot your own birthday," she scolded lightly, handing me a long thin box wrapped in green paper with a yellow ribbon. "The cake is in the kitchen. We would have brought it in here, but I didn't think it was safe with all the chemicals and stuff we've used in here," Infernus commented, handing me what appeared to be a gift certificate to a hardware store. I looked around, overwhelmed. A thought came to me. This is what I'm fighting for. This is what Nightmare wants to destroy. I looked at Kiddo, then at Infernus, then at Un-Eairkagh. A grim resolve came over me. Nightmare is messing with my family. That is not acceptable. I looked up at all of them, and spoke. "All of you, thank you. It's sometimes easy to forget what friends we have, and what love we can find from our family. There is something I haven't told you all." Haltingly, I related to them the story of the past few days - my odd dreams, the meeting with Fyora, and finally, Nightmare's dark intentions. I didn't tell them about the Shadows, as I didn't know enough about them to be useful. Throughout all of it, they listened, not once doubting a word I said. When I had finished, I looked over all of them, a sense of pride coming over me. "I can't do this on my own. Thanks to all of you, I don't have to. I don't know how, but Nightmare is going down." I smiled, and looked down at my pajamas. "Now let me go get dressed, so we can have a party." Cheers erupted all around. "Join me and you will live," Nightmare had said. "Forget those you love, forget all that you care about." He had really believed that I would give in, I thought, as I helped serve the cake Infernus had made. But he made a mistake. One little mistake that I was going to use to bring him down. "KRAWKER_OTH! What kind of English is that you possess?! Did you not have me as your English teacher this year?" "So that means that Jhudora's paying the Snowager with the treasure he's guarding, so that the Snowager will guard Jhudora's treasure, that even he can't get?" "The green Pteri that you captured earlier today. What do you plan to do with her?"